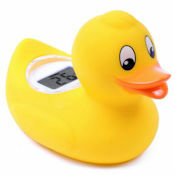 The Digi Duckling thermometer is incredibly easy to use and provides accurate water temperature readings making your little one’s bath time both safe and fun! To turn the unit on, simply tap the thermometer against the palm of your hand and place into the bath to view the digital thermometer reading on the large LCD screen. This will display an accurate reading from 0°C - 50°C, in steps of 0.5°C and a red light will illuminate if the water is too hot. Love this product - so easy to use for worried first time parents! Service and delivery were excellent. Have recommended to all first-time parent friends!